It may be said without exaggeration that Tuscany is a small piece of paradise. It is conveniently situated in central Italy. This region can be hardly described. Incredible land attracts many travelers. Tuscany is the best destination if you want to enjoy landscapes, visit the best coasts of entire Italy and touch the history. Tuscany has been a source of inspiration for great artists, poets, sculptors and writers since Michelangelo. Six cities of the region are placed on the List or World Cultural Heritage of UNESCO. None of the other parts of peninsula can count so many spectacular architectural monuments. 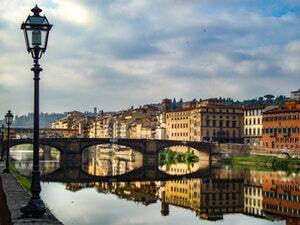 Florence, capital of Tuscany, is a masterpiece created by humanity and for humanity. You are planning a wedding in Tuscany? Use professional advices and help of our team. Wedding-Italian will fully take care of all preparations, ceremonies and even smallest details. We will do everything that is possible to make you fill convenient and happy on this really special for you day. We can safely say that Tuscany was not overlooked by nature. Its landscapes and views are familiar even to those, who have never been there. 70 % of its territory are covered by hills. Tuscany have access to two seas and even Alps. Though agriculture it the main occupation of local non-urban population every piece of land is under cultivation. All of this has an impact on the region`s landscapes. Colorful hills, golden at the sunshine, greet the eye and soothe the spirit. This terrain is ideal for bizarre games of light and shadows, that makes this fields unique. And, of course, Tuscany views cannot be provided without strait lines of vineyards that are stretching trough hills and valleys. You could not find any fences here. That is why none of foreign objects hinder to observe all that beauty. There is a wider choice of sites for wedding in Tuscany. You can choose historic hotels in the most famous valleys, medieval castles on the picks and villas surrounded by kilometers of vineyards. Notwithstanding crazy Italian rhythm of life, time in Tuscany slows down. It is hard to find such appeasement and relax somewhere else. That is why Tuscany wedding choice is a choice of romantic and dreamy people, who want to escape from noisy cities with all their troubles and rush. Silence, landscapes, great vine and tasty food – best companions to help you to enjoy your wedding trip. customized wedding programs and so on. If you want to learn more about our services, experience and prices, use phone numbers or request a call in the website header to contact our manager!